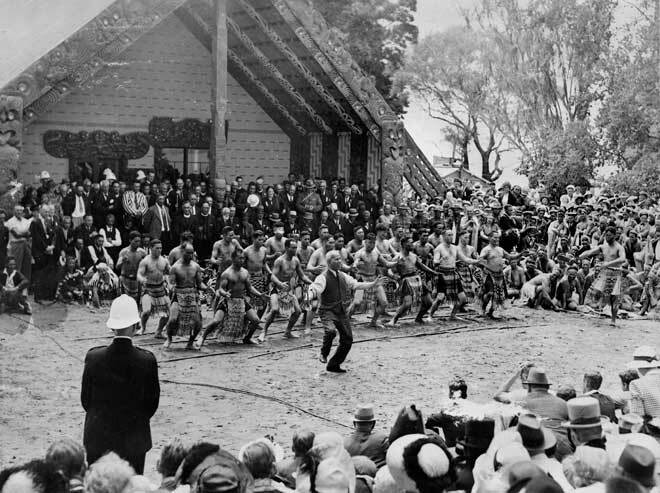 This iconic image shows politician Sir Āpirana Ngata leading the haka at the centennial celebrations at Waitangi in 1940. However, Ngata was forthright in his comments at this time, saying, 'I do not know of any year the Maori people have approached with so much misgiving as this Centennial Year ... In retrospect what does the Maori see? Lands gone, the power of chiefs humbled in the dust, Maori culture scattered and broken.' He also commented on land injustices around the country, observing that some Māori had worn red blankets at Waitangi as a reminder of land injustices.